If the 2015 Hyundai Santa Fe Sport crossover SUV could express emotion, it would start by breathing a huge sigh of relief, as the current Santa Fe generation is the first to feature the company's distinctive fluidic-sculpture design language. 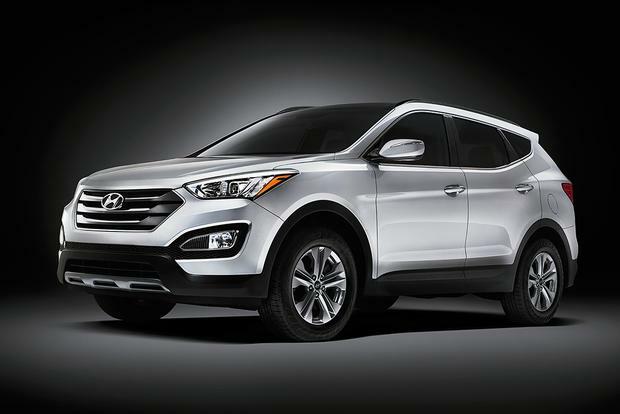 Until 2013, the poor Santa Fe had to stand by and watch as one Hyundai after another was treated to dramatic new duds. Even the pip-squeak Tucson crossover, a size smaller than the Santa Fe, got its extreme makeover first. But now the Santa Fe Sport's fully on board, and we think this is one of the best-looking Hyundai models yet, a sleekly sophisticated vehicle in a segment better known for boxiness. The revolution continues inside, where a curvaceous dashboard and quality materials give the Santa Fe Sport a surprisingly premium feel, especially relative to its generic predecessor. 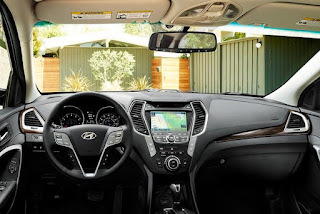 As expected from Hyundai, the standard features are plentiful, including iPod/Bluetooth connectivity and the Blue Link telematics suite with features such as voice text messaging, a local business search and turn-by-turn navigation. Less expected, but certainly welcome, is the optional turbocharged engine, which isn't the most refined engine in its class but delivers plenty of passing power. Hyundai's lineup is top-to-bottom impressive these days, but the 2015 Santa Fe Sport stands out even among its distinguished relatives. If rival crossover SUVs could express emotion, they'd be none too pleased about Hyundai's latest. The Santa Fe Sport adds a driver blind-spot mirror and a one-touch up/down passenger window as standard, while a hands-free power lift gate joins the options list. All Santa Fe models come with a responsive 6-speed automatic transmission and are available with either front-wheel drive (FWD) or all-wheel drive (AWD). Standard on the base Santa Fe Sport is a 2.4-liter inline-4 rated at 190 horsepower and 181 lb-ft of torque. Fuel economy is a pedestrian 20 miles per gallon in the city and 27 mpg on the highway with FWD and 19 mpg city/25 mpg hwy with AWD. The 2.0T boasts a turbocharged 2.0-liter inline-4 good for 265 hp and 269 lb-ft of torque. Happily, fuel economy doesn't suffer much, checking in at up to 19 mpg city/27 mpg hwy with FWD and 18 mpg city/24 mpg hwy with AWD. The 2-row Santa Fe Sport is offered in base or 2.0T trim. Feature highlights for the base Sport ($25,845) include a 2.4-liter 4-cylinder engine, 17-inch alloy wheels, LED headlight and taillight accents, a rear spoiler, air conditioning, electronically adjustable steering effort, power accessories, a tilt-telescopic steering wheel, cruise control, a trip computer, Bluetooth and a 6-speaker audio system with satellite radio and iPod/USB connectivity. The Sport 2.0T ($32,145) adds a high-powered 2.0-liter turbocharged 4-cylinder engine, dual exhaust outlets, 18-in alloy wheels (19-in alloy wheels are also available), heated exterior mirrors, a blind spot monitoring system, automatic headlights, fog lights, keyless entry with push-button ignition, an auto-dimming rearview mirror, an electroluminescent gauge cluster with a color LCD information screen, a 4.3-in touchscreen audio display with a rearview camera, a leather-wrapped steering wheel and shift knob, leather upholstery, a sliding back seat, dual-zone automatic climate control and power heated front seats with driver lumbar. The base Sport can be optionally equipped with many of the 2.0T model's standard features. Other notable options, depending on trim, include xenon headlights, LED taillights, a hands-free power lift gate, a panoramic sunroof, a navigation system with an 8-in touchscreen, ventilated front seats, heated back seats, a 10-speaker Dimension audio system (base Sport only) and a 12-speaker Infinity audio system (2.0T only). On the hauling front, the Sport offers 35.4 cu ft. of cargo space behind the back seat and 71.5 cu ft. with the rear seatbacks folded. That's a lot of cubes at this price point. 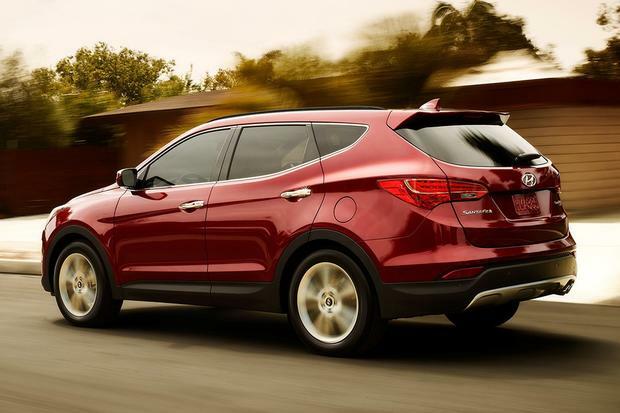 A properly equipped 2015 Hyundai Santa Fe Sport can tow up to 3,500 pounds. 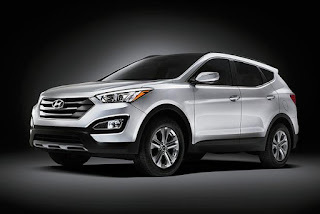 The 2015 Hyundai Santa Fe Sport comes with standard stability control, 4-wheel anti-lock disc brakes, active front head restraints and seven airbags (front, front-side, driver-knee and full-length side-curtain). In government crash tests, the Santa Fe Sport received a perfect 5-star rating across the board. Likewise, the independent Insurance Institute for Highway Safety (IIHS) awarded the Santa Fe Sport its top rating of Good in all tested categories. In our interior evaluation, we found the Santa Fe Sport's front seats to be pleasantly firm and supportive. As ever, the seats are mounted high, so you get that SUV-style commanding view of the road that many shoppers want. Thankfully, the Santa Fe Sport comes standard with a tilt-telescopic steering wheel so you can adjust the wheel for reach as well as angle. There's even some wood-grain trim sprinkled around the cabin that adds a touch of class. The Santa Fe Sport's dashboard is full of appealing angles and curves, while the deeply hooded gauges with available electroluminescent backlighting further attest to this crossover's suaveness. We're pleased to report that the controls remain straightforward and easy to use despite the stylized presentation. As for the back seat, it has a pleasantly elevated bottom cushion and ample room for adult passengers. Hyundai emphasizes that the Sport is considerably larger than rivals such as the Ford Escape, and that's evident in the airy feel inside. We're also impressed that sliding back seats are available. Under the hood, the base 2.4-liter engine is all most folks will need. Blessed with a broad power band and good manners, this is largely the same engine that we've lauded in the Sonata midsize sedan, and it's satisfying here, too. But if satisfying isn't enough, the turbocharged 2.0T delivers a pretty serious punch, with one caveat: The power comes on rather suddenly around 2,500 rpm or so, with relatively modest get-up-and-go off the line. On the road, the Santa Fe Sport is about as good as it gets for a crossover at this price. The highway ride is quiet and smooth, while bumps are dispatched with impressive poise. The handling isn't bad either, and AWD models even have what Hyundai calls Torque Vectoring Cornering Control, a system that can send either extra torque or braking power to individual wheels. 2015 Ford Escape -- The Escape might be smaller than the Santa Fe Sport, but its back seat can still accommodate a couple of adults with ease, and you can get one with a 2.0-liter turbo and MyFord Touch to match the Santa Fe Sport 2.0T with navigation. 2015 Kia Sorento -- Distantly related to the Santa Fe, the Sorento lets you have V6 power in a 2-row package and 4-cylinder power in a 3-row package, two combinations that the Santa Fe Sport can't match. 2015 Mazda CX-5 -- Mazda's do-it-all crossover is capable of better fuel economy than the Santa Fe. It also feels tighter and more dynamic on the road.